Taylor and I are busy gearing up for a long and cold winter here at the farm. As a result, we are in total panic mode in the food department. We go through this every season in the late fall and spend a lot of our time digging up the remainder of the root crops that are still out in the fields. This year we even went as far as purchasing a beef share from our favorite rancher– Tim Jefferies— so we’ll have plenty of local, grass-fed beef to get us through the winter. The state of our barn and chest freezer is enough to assume we’re preparing for the end of the world! But honestly, since the farmers markets are done for the season we’ve gone into full-blown hoarding mode! If we can make it through the winter still eating primarily local ingredients we’ll feel pretty darn good. The chest cooler of beef (and other meat/canned goods) is a good place to start, along with our storage crops. Besides, we’re going to miss seeing Tim every week at the market so at least he’ll be near us at the dinner table when we prepare his meat. Taylor and I actually joked that we could almost hear his laugh across the table when we we’re eating this meal. Tim– we obviously miss you (and it’s only been a week!) thank you for feeding/sustaining us through the winter. We love you! 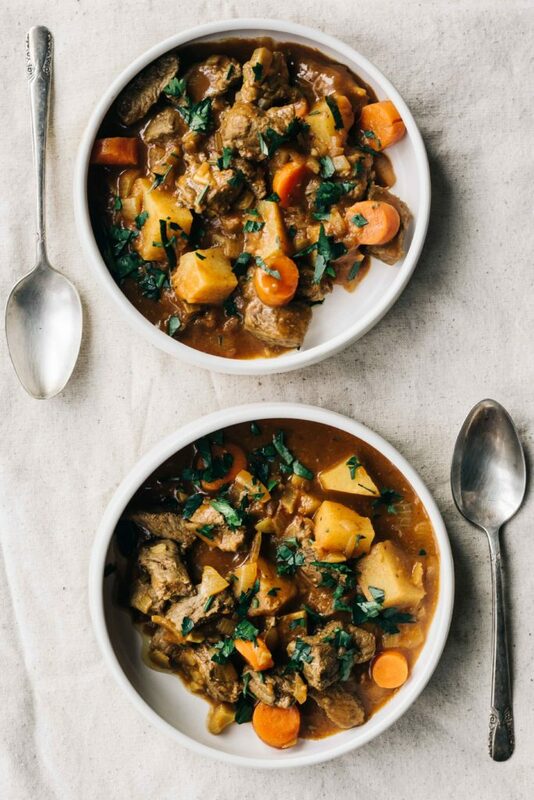 This rutabaga and beef stew is comfort food at its best. We’ve got a ton of storage rutabaga in the barn and this was a great way to incorporate it into something hearty and deliocus. This stew is made with warming spices, hearty vegetables and nourishing meat. This is one of those meals that’s worth making for the sole purpose of making your entire house smell amazing. Pair with a glass of red wine, toasted bread and your favorite dinner date for a cozy night at home. Sprinkle steak with 1/4 teaspoon salt and pepper. Heat 1 tablespoon oil in a large dutch oven or saucepan over medium heat. Add the steak and cook, stirring frequently, until no longer pink on the outside, about 4 minutes. Transfer the steak to a plate. Add the remaining 1 tablespoon oil to the pan over medium heat. Add rutabaga, carrots, onion, garlic, tomato paste, paprika, cinnamon, turmeric, coriander, cayenne and remaining 1/4 teaspoon salt. Cook, stirring occasionally until the onion begins to soften and the mixture is fragrant, about 5 minutes. Add the flour and cook, stirring, for 1 minute more. Add the red wine and continue to cook, stirring to break up any bits that have stuck to the bottom of the pan. Add the broth and bring to a boil over medium-high heat. Cook, stirring occasionally, until the rutabaga and carrots are tender, 10-12 minutes. Add the steak and any accumulated juices to the pan. Reduce the heat to medium and cook the steak through, about 2 minutes longer. Divide the stew between bowls and top with plenty of chopped parsley. Serve with crusty bread and red wine for a complete meal. Made this stew last night. It is so good!! I grew up being told that what is called a rutabaga was a turnip. Last year I went to a Whole Foods to buy what I thought was a turnip and the sign for the veg said Rutabaga. But I guess in New England where I am, they are called purple topped turnips and yellow turnips. Anyway this stew is very very delish!! Personally, next time, I’d leave out the cinnamon and coriander. But when I first tasted it the spicing was strange but then that strangeness disappeared and I wolfed it down!! Thanks for all your great recipes! I look forward to your emails every day. this was jam packed full of flavour! It was so delicious & simple to make. One of my favs now! Made this and it was very lovely. It will be my go to stew finally!